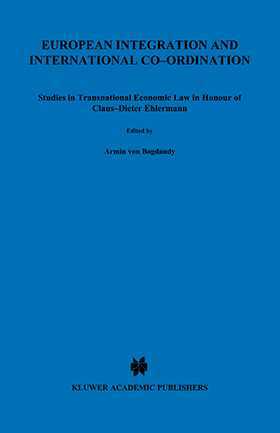 Claus-Dieter Ehlermann is widely regarded as among the most knowledgeable, far-sighted, and creative shapers, practitioners, and scholars of European law. Among the prominent legal roles he has played in his influential career, his leadership of the Legal Service of the European Commission is perhaps the best known. This liber amicorum appears as his term at the Appellate Body of the World Trade Organization draws to a close. the place of human rights in European and global integration. In its wide-ranging appreciation of the many tributaries that must come together if legal and economic integration is to be both human and prosperous - whether in Europe or in a wider field - European Integration and International Coordination is a rare work. Its precise but far-reaching evaluations and proposals, worthy of the scholar and practitioner to whom they are dedicated, will find thought-provoking echoes in the minds of all those concerned with any of the integration processes under way in today's interdependent world.